At MENTE, Inc., we utilize the natural mental processes to guide the participants through the desired changes in their lives. Have you ever had a training or workshop that was so fun, yet thoroughly effective? If so, you were probably in front of an excellent trainer. Excellence in a training situation is NO ACCIDENT. It not only requires mastery of the material and a commanding, yet approachable presence, but also having knowledge and skills in Group Dynamics and a keen eye for the individual states of the participants from moment to moment. 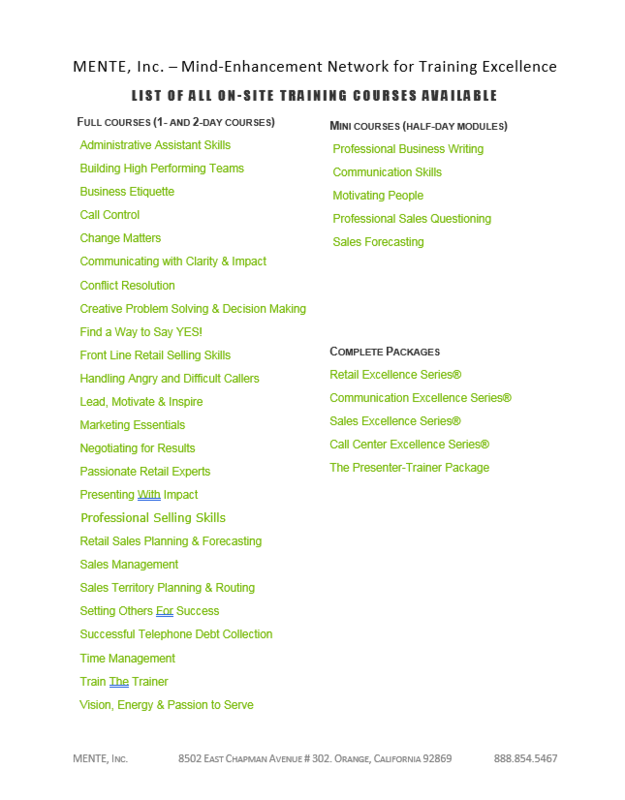 Whether you're looking for training in a corporate setting, for your own team in a small-group setting, or for individual training for yourself, to assist you in reaching heights you've only dreamt of or breaking through that plateau you've been facing, the network of excellent trainers who comprise MENTE, Inc. can provide you with a training experience that will benefit you for the rest of your life. Read about how people have benefitted from working with us. Team-Building Training - Imagine what it would be like to have your team working seamlessly and effectively together. Sales Performance Improvement - If you believe that your sales team (or your own sales) performance have some room for improvement, this is the right training for you. Goal-Getting Sessions - How would you like to set your goal in such a way that you'll KNOW you will achieve them? Elimination of Limiting Beliefs - If there is ANYTHING you have NOT achieved in your life, most likely it is due to a limiting belief you hold or a limiting decision you made unconsciously. Discover what can happen when you unfetter yourself of these internal limitations! Total Emotional Control - Just imagine that you can have immediate and total control over your emotions and responses at any given moment, and that you can CHOOSE your emotional state and, therefore, your level of performance. Custom-Designed Training - Have the experts at MENTE, Inc. design a specific training to fit your needs. Sometimes, success means just taking little steps in the right direction. in pretty much everything you do in life. tell me which one is higher." "The left one", he yelled back after being scared to look for awhile. than the right one. Can you do that, Tom?" left one. Can you do that for me, Tom?" Tom's not still on that mountain so you know the rest. sometimes that's all you NEED to do too. Call us now toll-free at (888) 854-5467 to discuss the steps you need to take.